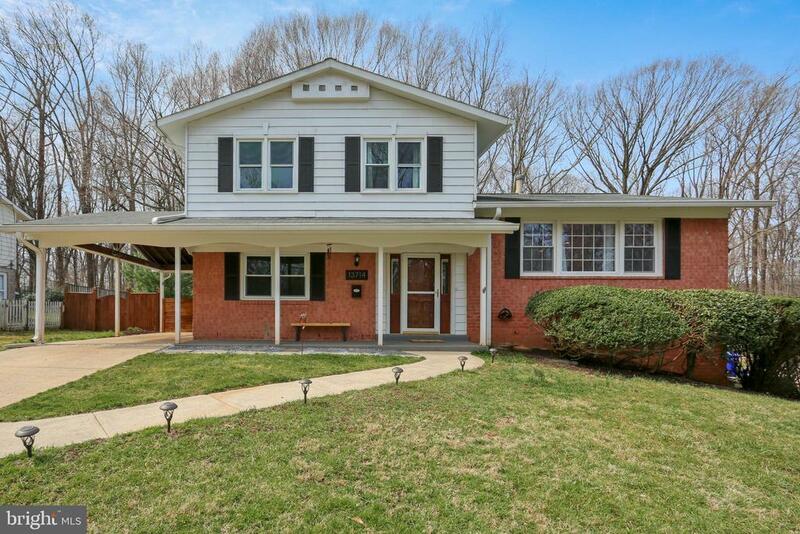 Live parkside in this beautifully updated, meticulously maintained 4 BR/2.5 BA Dalewood model Split Level w/carport, brick patio & vista views of Rock Creek Park in desirable Rock Creek Manor. Near schools, shopping, places of worship, commuter routes, trails, lakes & parks! Features & Amenities ~ 4 Bedrooms, 2.5 Baths~ Inviting Foyer with new solid wood door with in-glass blinds, large guest coat closet~ Updated well-appointed entry level Powder Room Bath with pedestal sink~ Sun-filled Living Room with stylish modern light fixtures, refinished hardwood floor, new double pane bay windows and recessed lighting~ Beautifully remodeled Gourmet Chefs Kitchen now opens to the light-filled Dining Room for easy entertainment and relaxing family dinners, keeping everyone connected; with stainless steel low profile appliances with special features like range with bread proofing & French door refrigerator, abundant sealed Quartzite countertops over modern floor to ceiling cabinets, under mount sink, porcelain backsplash, porcelain tile floor, recessed lighting, and bay windows with views to rear gardens, Play Yard, and lush, scenic Rock Creek Park~ Convenient Mudroom off the Kitchen and Family Room with porcelain tile floor and bench storage off rear door to the Brick Patio provides space for more pantry storage, access to rear yard~ Master Bedroom with En-Suite Bath features two double door closets with custom organizers, modern energy-efficient ceiling fan, refinished hardwood floor, and sun filled new windows to vista views of the park and woods~ En-Suite updated ceramic shower Bath includes new lighting, fixtures, and vanity~ 2 additional large Bedrooms feature spacious closets, updated lighting, hardwood floors, and sun filled views~ Full ceramic Hall Tub Bath with new lighting, fixtures and vanity and backsplash~ Fully appointed hall Linen Closet with organizers~ Entry level walk-out Family Room with hardwood laminate floor, floor to ceiling new windows with view to the Brick Patio and the Childrens Play Yard, lush rear gardens, and the parkland & trails beyond of Rock Creek Park~ 4th additional large entry level Bedroom/Study features hardwood parquet floor, closet, and modern energy efficient ceiling fan~ Finished lower level Rec Room with recessed lighting, laminate wood floor, and storage closet with organizers~ The walk-out lower level features Utility & Storage, Workshop, and fully appointed Laundry Room with extra freezer; door to partially fenced rear yard~ Carport and Shed with extended driveway make storage and outdoor care convenient. NEW and NEWER: Windows, Roof, HVAC, HWH, Kitchen, Brick Patio, Lighting, 200amp Heavy Up, etc, etc! Directions: NE on Norbeck, Right on Bauer, Right on Russett, Right on Drake, up the hill and to the Right!